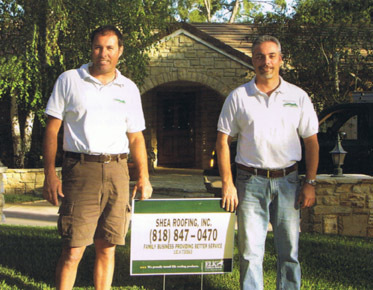 About Us | Shea Roofing Inc. | Shea Roofing Inc.
Brothers Bill Shea and Ken Shea have been doing all types of roofing in and around the Los Angeles area for over 30 years. The company has built a reputation for the highest quality of roof work in the area with prices that are reasonable. As well as repairing and replacing most types of roofs the Shea brothers have had great success in correcting many of your neighbors’ previously hard to solve roof problems. The difference between a good roof that has held up over the years and a bad roof that has leaked or come apart is who has put it on. With Shea Roofing, only qualified tradesmen who really know what they’re doing will work on your roof. We have as our primary goal servicing residential and commercial property owners with top quality, professional roofing services, whether you need repairs or a complete roofing remodeling. Furthermore, Shea Roofing takes pride and is committed to being reliable, fair, honest, courteous and professional to its customers. All of our work is guaranteed and backed by a written warranty. We will promptly come out, look over your roof and honestly let you know what your options are. All estimates are given free of charge and at your convenience. Please call us at (818) 847-0470 or fill out the Free Estimate form.